Aml Pages is a tree-structured notes organizer for Windows. It contains all your notes, information, web pages, passwords, URL-addresses in the form of a tree that you can quickly find what you need. The Aml Pages can easily save web pages (or fragments) from the Internet and provides a sticky «facility». Manage megatons of your notes with ease at work and at home. Versions are available in several languages: English, German, Portuguese, French, Russian, Spanish, Ukrainian and etc. Aml Maple has a new kind of view on keyboard layout indicators: simple, modern, flexible. Aml Maple indicates the active layout being currently used (the language you are typing at this particular moment). It is always in front of you, exactly at the place you are typing! The indication might be done in two ways either: by text cursor or mouse pointer or both of them. The indication in the text cursor is done by changing its color and indicating the language name to or below of the cursor. Hot news [09/04/2019 19:42] New version TwinkiePaste 2.90 build 553 released. 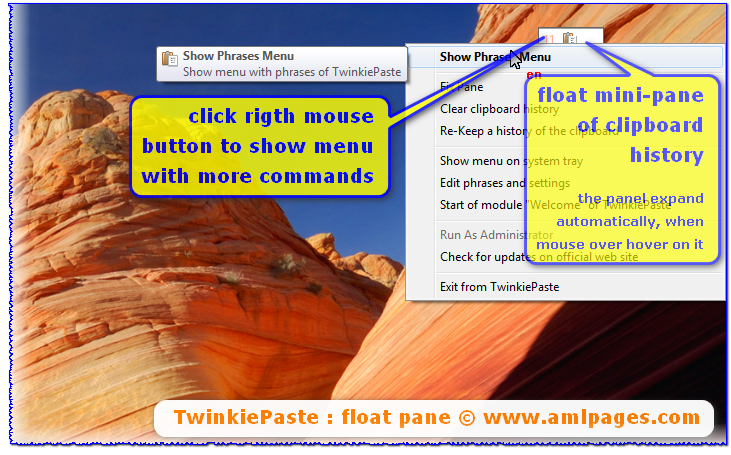 • added: support of HTML Format in Clipboard History (see menu on right click in the float pane of TwinkiePaste). • added: button "Pin" into float pane. • added command: Copy As HTML. • added command: Copy As RTF. Details change log see here. You can download multilingual version with installer or portable version. New video about using TwinkiePaste: «How to insert, text snippets, start Google Search via TwinkiePaste». Paste commonly used text phrases with hotkeys from menu anywhere. TwinkiePaste saves hours of typing! It is the ideal solution for personnel in office, technical support, customer care, help desk, call center and medical or legal transcription settings. Pastes plain or formatted text into any applications. Keeps the clipboard history. Smart text insertion using macros: selected text, date and time, changing of keyboard layouts, usernames and etc. WriteYours is free text expander for Windows. Type less — save Your fingers! WriteYours saves your time and your keyboard, expanding keyboard strokes into frequently-used text. WriteYours increases your productivity by inserting frequently used text phrases into any Windows application. Type a pre-defined text shortcut, and WriteYours expands it into the full phrase. The simple processes manager for Windows 9x\2000\XP\Vista\7\8.x\10. Support management of process and threads and searches by module name. Allows you to add external viewers for processes, threads and modules. Free utility that optimizes the work with the mouse wheel under MS Windows. Mouse Hunter work with any applications.